Over the past week, I’ve started harvesting the tomatoes. So far, I’ve gathered eleven tomatoes. One of the first things I noticed about them, especially after reading an NPR article on heirloom tomatoes, is the “green shoulders” the tomatoes have. This is apparently something that pretty much all heirloom tomatoes have and is one of the reasons that heirloom tomatoes taste different from the tomatoes available in the supermarket. Pinto bean plant with pods a day or two from being ready to harvest. The other harvest I have going on right now is pinto beans. I have been getting a nice steady harvest since the first pods I pulled off the plants. The number has steadily increased over the past two weeks. Now I am getting about thirty pods a day. I have easily recovered the seed beans I planted this year and I don’t see the harvest stopping for several months. 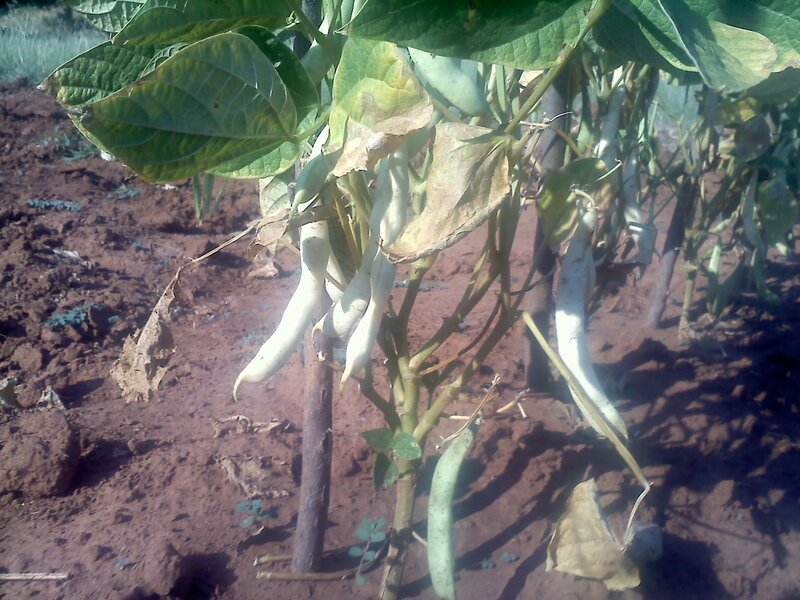 The first row of beans directly planted in the ground is starting to flower and in a few weeks will have their first bean pods starting to grow. It is about a month after the first pod appears to when the pods can be harvested. A double row of bean sprouts. In a week or two, this is going to be a nice, thick row of bean plants. 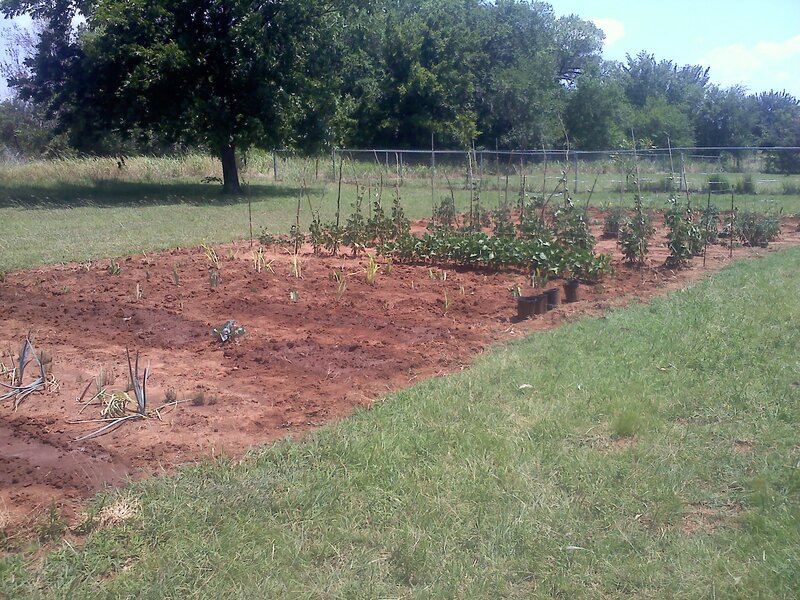 Last week, I planted another set of bean plants directly in the ground. This time, I am trying a double row of beans to see how that works. I hope it works well, as using a double row should allow me to plant the beans more densely in the garden plot, meaning more beans in the same amount of space. I was planning on just using beans as a green manure, but now that it seems likely that I will be able to get beans off these plants, I will take all the beans I can get. I’m interested in seeing how many I can get before frost kills the plants. One of the seven completely capped frames. I inspected the super I am planning on harvesting this year. This will be the first honey harvest I will be getting from the hives. I would probably have gotten more honey this year had the swarms not happened and all the supers were already drawn. 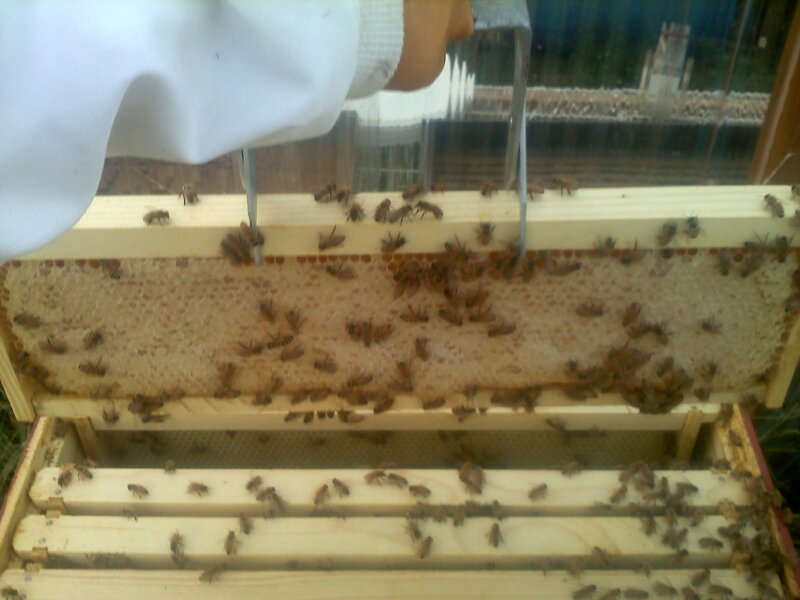 With all fresh frames, the bees had to use a lot of the nectar they collected to draw the foundation out instead of turning it into honey. There were seven completely capped frames of honey, two frames that are still being filled with honey and only a small number of the cells were capped, and one frame that still hasn’t been fully drawn out. Three of the tomatoes are turning red. This is one of them. 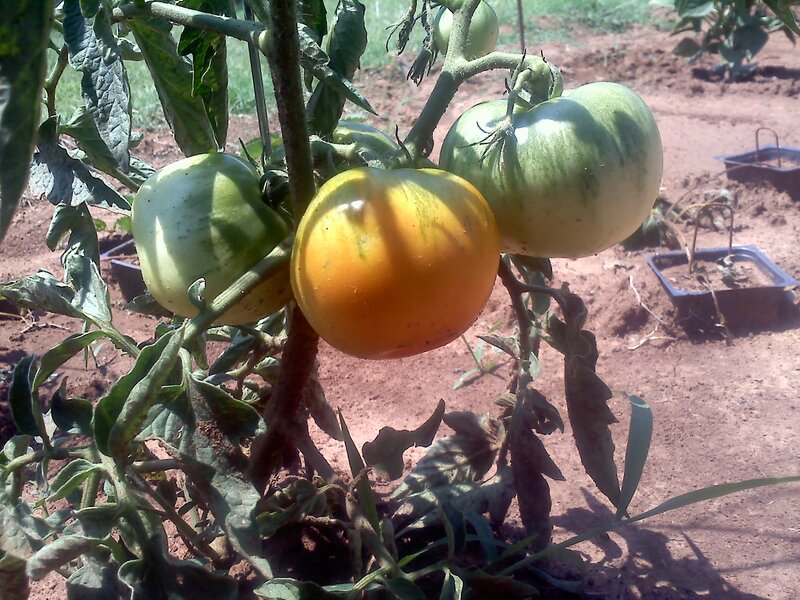 I’ve been awaiting this moment all year: I have my first tomatoes ripening. I’m not quite sure when this variety of tomato is best picked, so I am trying a few different times to get a feel for the timing. The remaining tomato plants have more tomatoes that I am willing to count right now, and several of them will probably start ripening soon. 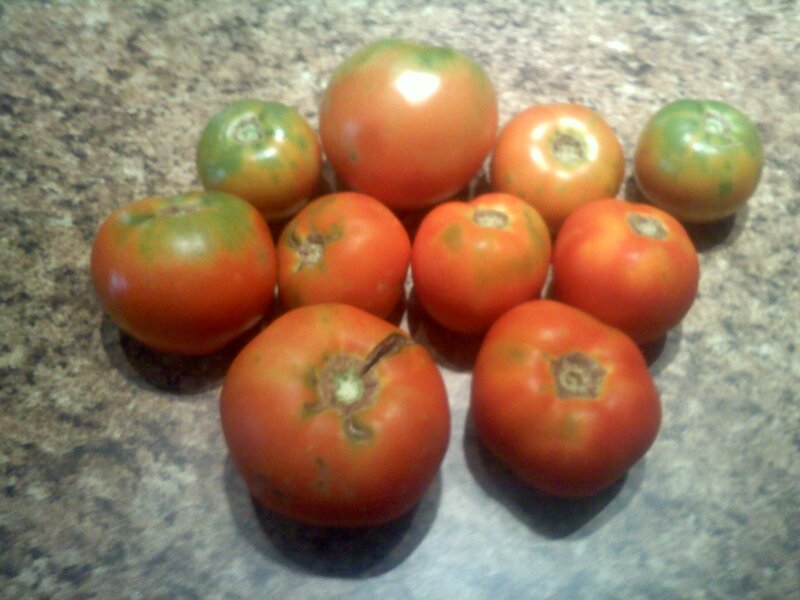 I suspect that I will have a nice continuous tomato harvest from now until the frost kills the plants. Once I start processing the tomatoes, I am going to attempt to save seed for use next year. I’ve seen a few tutorials on how to save tomato seeds, but like everything else I’ve learned, there is a fairly big difference between watching somebody doing what you want and actually doing it. 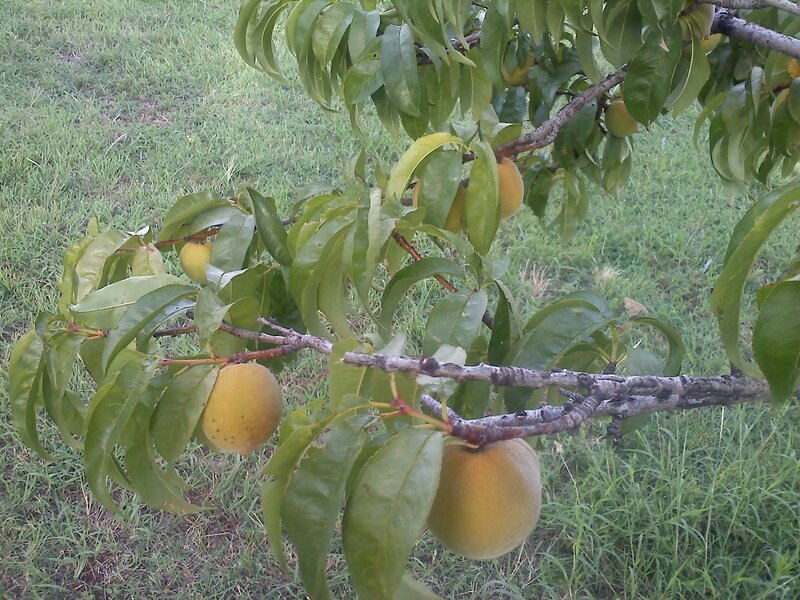 The peaches have started turning color. It has been a while since I posted anything on the peaches, mainly because nothing interesting has been happening with the peaches. They have just slowly, but steadily, grown in size. Now, they have finally started changing color. This signals that they are getting close to being ready to harvest. I am guessing that harvest will be between two weeks and a month and a half. I really don’t know how long they take and when exactly they are ripe. As soon as they are ready, though, they will all be harvested, pitted and canned for use later. The garden is pretty much full now. My mother came over today and brough seventy strawberry plants, numerous irises, day lilies, and assorted other flowers. Because I don’t really have anywhere else to put them at the moment, they went into the garden plot. Many of them will be remaining in the garden for as long as I can keep them alive and I will be dividing them for the plants that will go into the front flower beds. Those beds need some work to get ready and I won’t be doing that until next spring at the earliest. 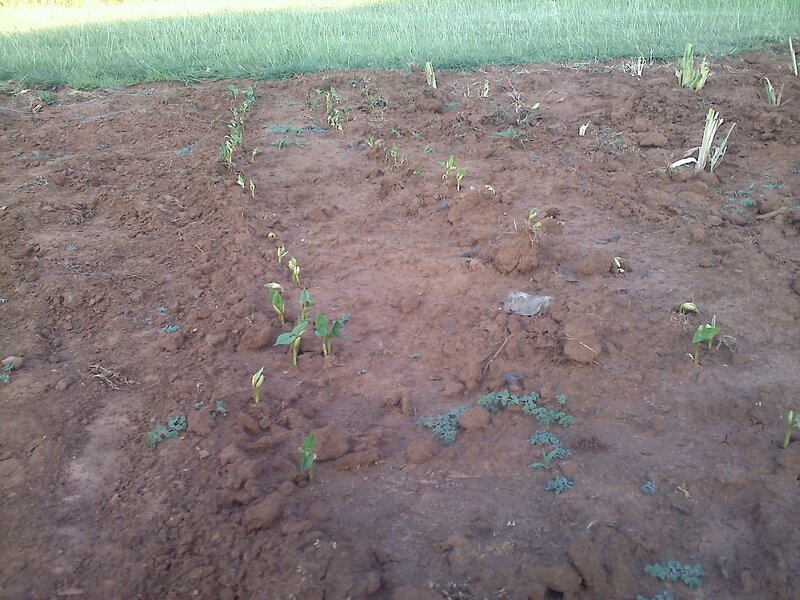 The space in the garden plot that was remaining after the flowers went in, I planted out with more pinto beans. This is for fertilizing the ground thru nitrogen-fixing bacteria, experimenting with planting methods and if I am lucky, some more beans. 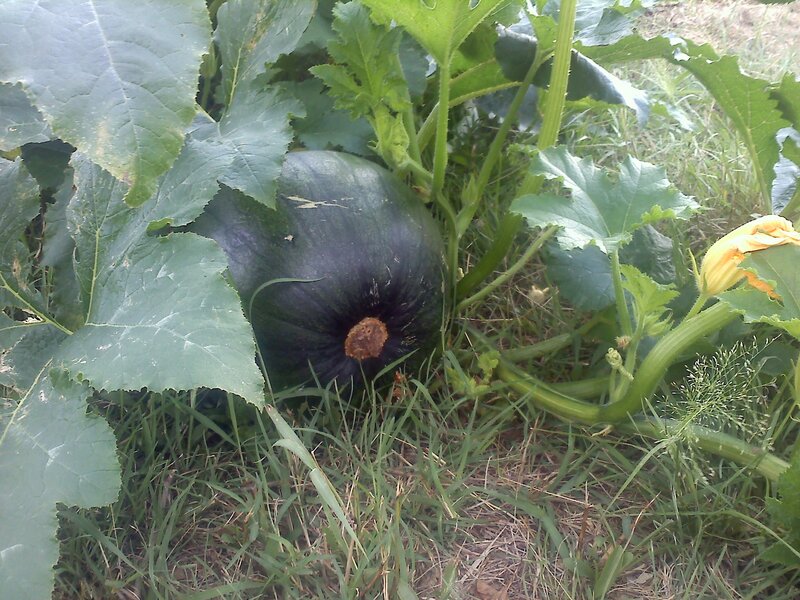 The pumpkin continues to grow larger. If I want to grow more food next year, I will end up needing to expand the garden plot. I have already expanded the plot by about a foot on one side already, and it is a lot of work with a garden hoe. The two biggest problems with doing this is hard, dry Oklahoma soil and grass. The first limits how much time I have to work the soil and the second makes it a lot more difficult. Especially when it tries to take back the area already cleared. I know that machinery would make it take a lot less time, but I enjoy the exercise I get doing it by hand, especially since I end up sitting at work so often. Onions, straight out of the garden. This is the post I was intending on writing before I found out that pretty much every one of my zucchini plants was dead. Three days ago, I needed decided it was time to thin out the onions so the remaining ones could grow large. Because I didn’t have anything I could use them for immediately due to a fridge full of leftovers, I decided that I was going to preserve the onions. There are probably other methods of doing so, but I use dried onion a lot and I have a dehydrator, so that is what I did. Diced onions on the dehydrator. After washing the dirt off the onions and removing the half-eaten ones, I diced them so that when they dry, the onion pieces would be conveniently shaped for cooking. I ended up needing one of the trays that is supposed to be used for making fruit leather because the individual pieces kept falling thru the normal tray. 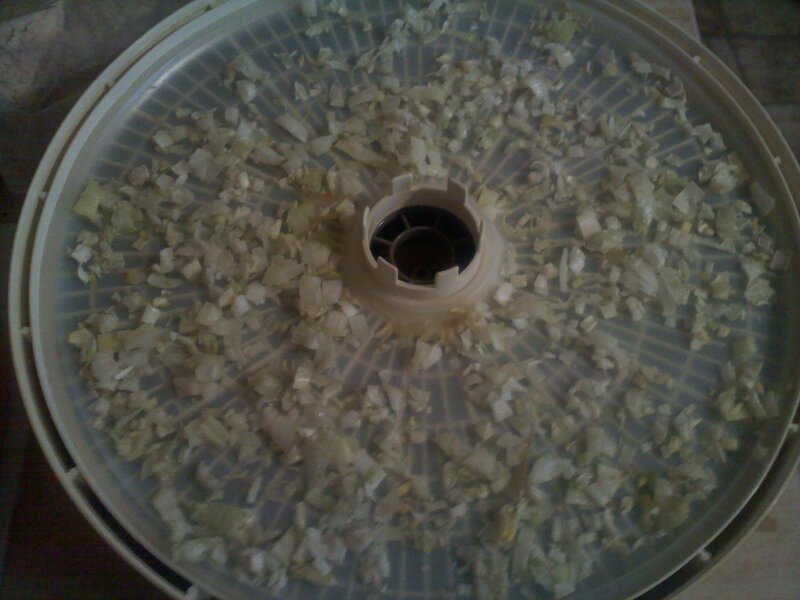 A word of warning to others that attempt this: dehydrating onions will make the entire house smell like onions for a few hours and some of that is the substance that makes your eyes sting. 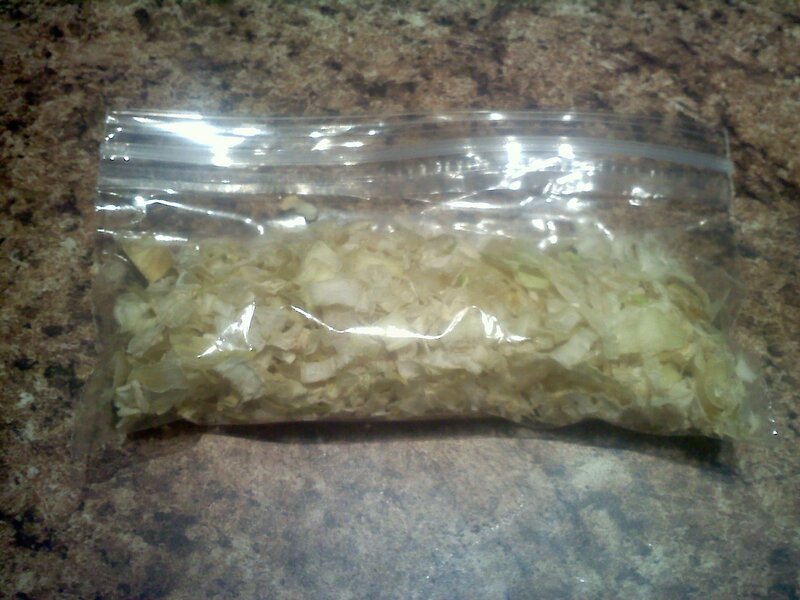 The end result of the drying was nice onion flakes that I will use for cooking. Onions dried like this will keep for a year or two on the shelf, but they get eaten a lot sooner than that. 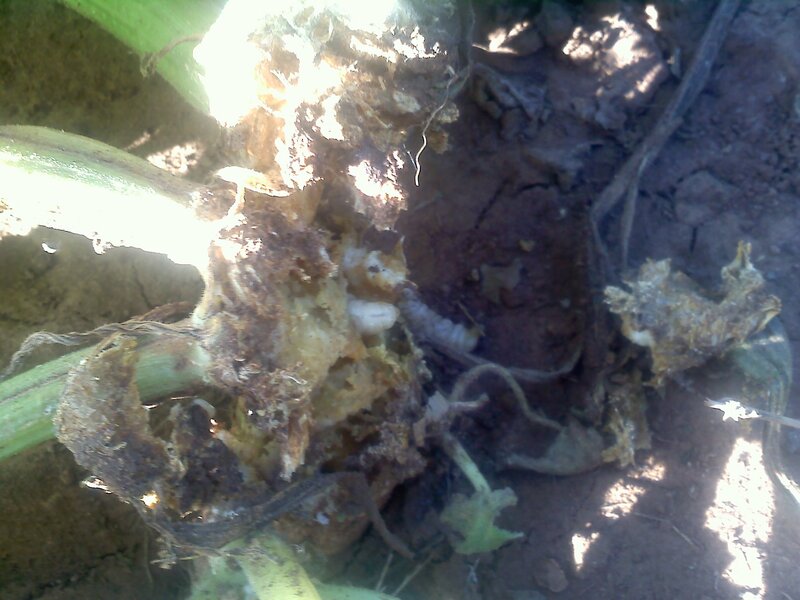 Squash borers eating the stalks of the zucchini plant. I just thought the wind had knocked over the plant. I was planning on writing about the onions I dehydrated over the last two days. 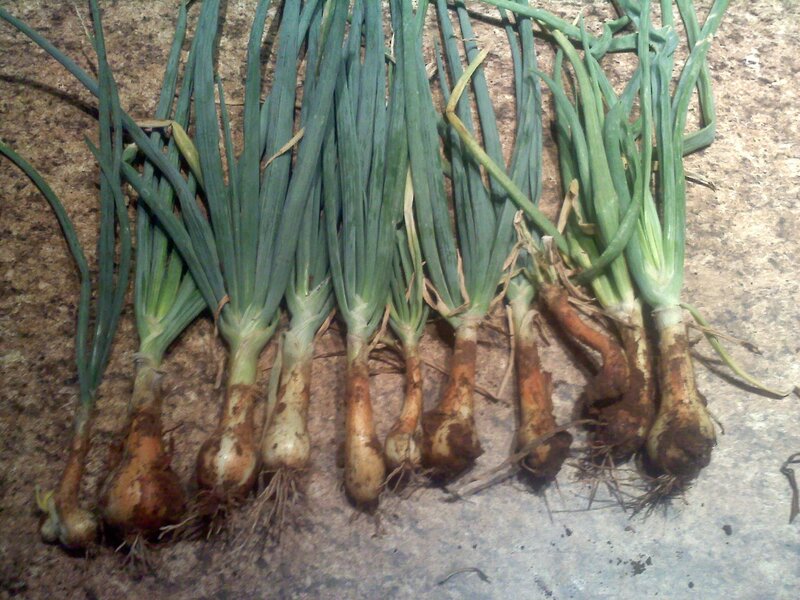 I use dehydrated onions in many dishes, so I was very glad to have made grown some myself. I even got part-way into writing the post. But I couldn’t finish it. All I got was a couple of sentences. That is because I discovered that all my zucchini plants are dead or dying today because, in addition to the squash bugs that I am constantly killing, squash borers ate out the stocks and killed the entire plant. So I killed all the grubs I could find and pulled up the plants. So the two zucchini I harvested will be the last of this season. This just reminds me of how much I still need to learn about growing food. The pods, beans and the bag of “seed” I used. Organic pinto bean seed from Guthrie Whole Foods. Wasn’t intended as seed by the store. This has been a busy weekend. I’ve had my first zucchini harvest, have pumpkins on the way, and now I have my first pinto beans harvested. I only have a grand total of eleven beans harvested, but by the looks of things, I should be harvesting beans steadily from here on out. 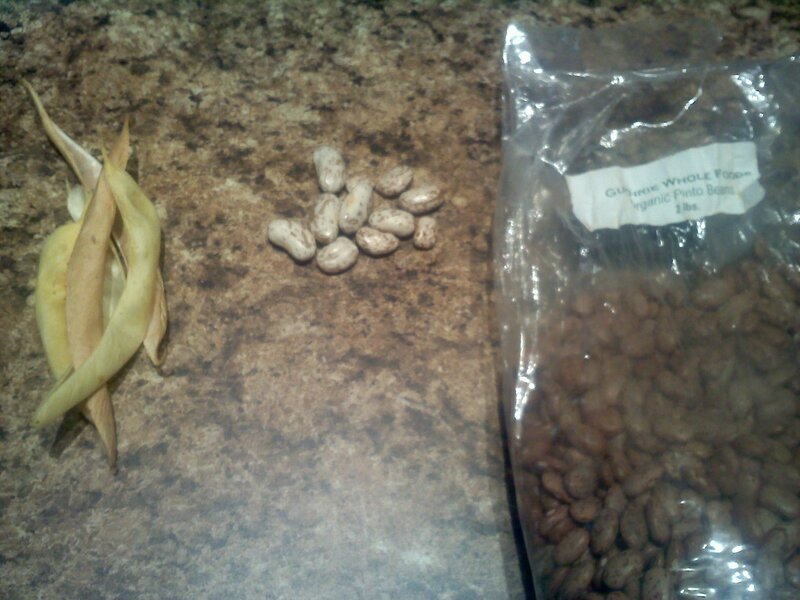 A few of the beans are considerably larger than the seed I used, but I suspect that they will shrink as they dry out. They still feel a bit squishy and waxy instead of being hard beans like the original seed I have. Also, the beans are a bit lighter than the seed, but they may darken with time also. 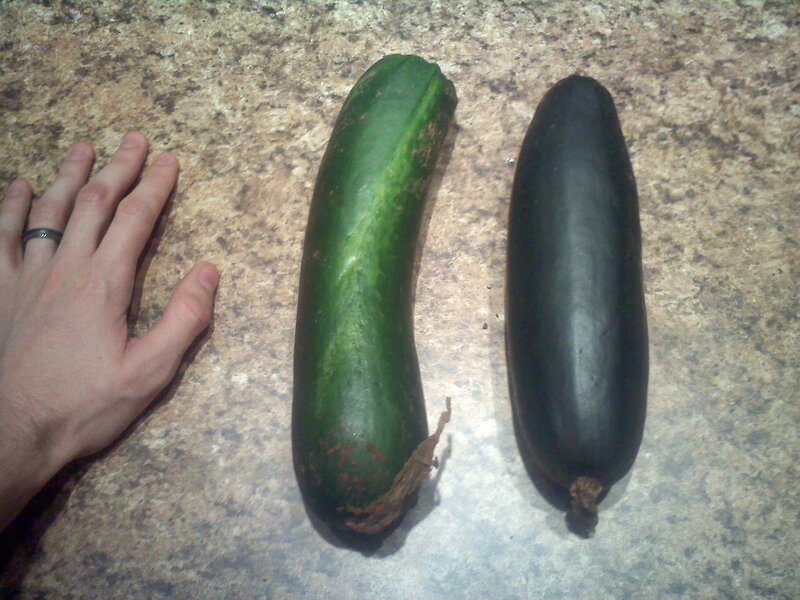 The two zucchini I picked today. My hand for size reference. Today, I harvested the first two zucchini from my garden. One of the two I probably should have picked a couple of days ago, but at least it is done now. I weighed them together in my spring scale and got 0.91±0.07 lbs. Figuring out that amount has me questioning the accuracy of my scale calibration. It is still better than no scale at all. 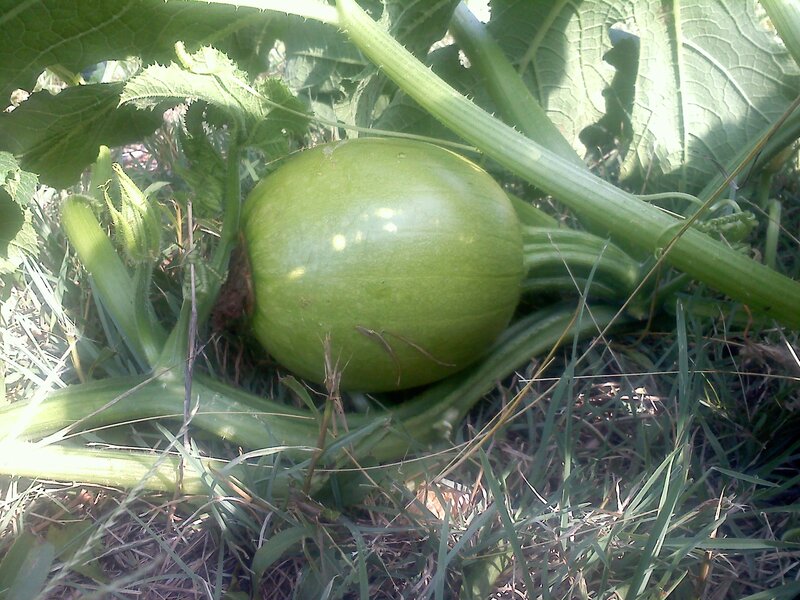 I found that one of the pumpkins is growing very well. I have no idea if I will be able to get any food from these. The pumpkin the seed came from was used as a jack-o-lantern. The whole plant was an accident as I never intended to plant pumpkins. There were some pumpkin seeds in the compost I brought with me from my previous residence that decided to start growing out of the compost pile. Next year, I will be putting them into a more convenient location that doesn’t get in my way when I try access the compost pile. 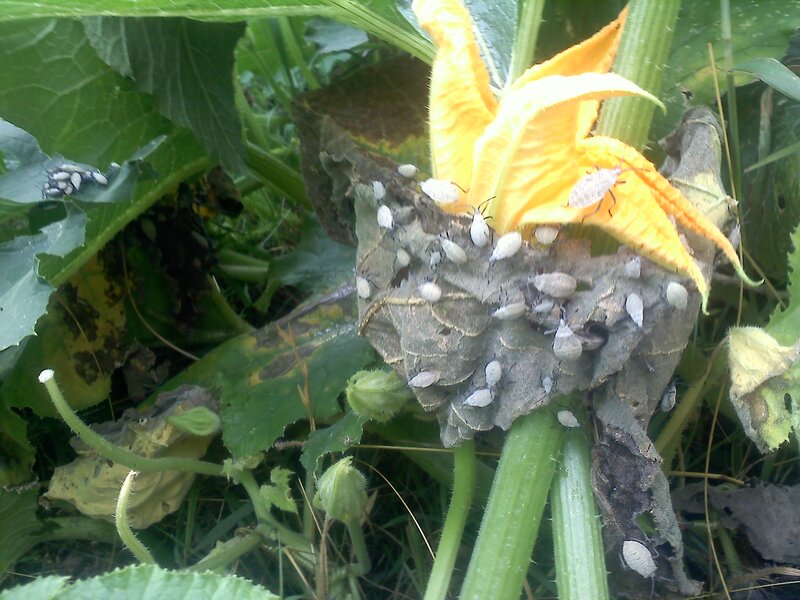 Squash bugs on my pumpkin plant. I found some bugs about a week ago on one of my zucchini plants. Today, I found some on the pumpkin plant. In both cases, my response was to squash all the bugs I could get my hands on and to remove any eggs I found. Turns out these are squash bugs. For now, my response to these pests will be to squash all the bugs I can get my hands on. If it gets beyond my ability to keep up with them, I will probably get either diatomaceous earth or pyrethrin. Both of these are almost non-toxic substances. The first is fossilized shells of microscopic organisms and the latter is extracted from the seed pods of Chrysanthemums and both are safe for use around bees.